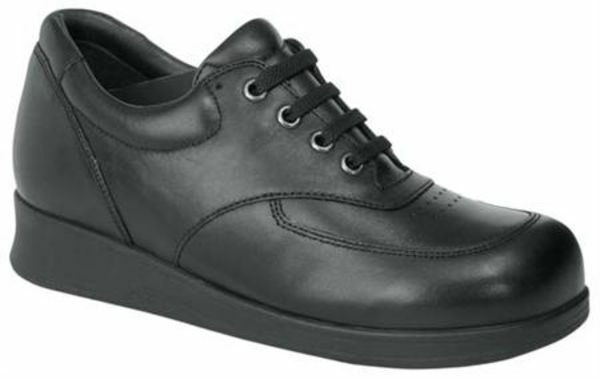 Drew Fiesta shoes offer a great-looking oxford with a wide, comforting toe box that matches the actual shape of your foot. Protect and prevent bunions, hammertoes, corns and calluses while wearing these women’s orthotic shoes. The dual-density EVA insole found in our Drew Fiesta shoes contours to the foot through your own body heat, and provides maximum shock absorption for incredible all-day walking comfort. Ultra-soft Drilex linings wick away moisture while a padded tongue and collar contribute to the overall comfort of one of the best women’s orthotic shoes in the industry. Click to see all the Drew Fiesta colors. drew fiesta I can't imagine anyone not happy with these shoes. They are worth the money. They do not squash your toes and are sooooocomfy. They fit my feet and my AFO! These are the first shoes I've found that are shaped like my feet. They fit like a glove, and my AFO braces fit in very comfortably. My Drew Fiesta Shoes fit very well and comfortable. I have been wearing Orthotic shoes since 2005. Drew shoes meets all my needs. Advantages: Reliability, Comfort, looks, and support. Disadvantages: Haven't found any yet!